Expecting Rain • View topic - New record? Post subject: Re: New record? 1) Dylan said after the recording of Tempest he wanted to make a purely religious album. I predict a new Dylan gospel album. There's been a lot of rumours and speculation over the past year or so: the eventually deleted twitter post referencing the state bird of Minnesota and Lanois in the same breath, the interviews with Mavis Staples, the filming with John Hillcoat in Dublin, and the most recent Don Was recordings confirmed by the man himself and people close to Dylan's camp, etc. None of this exactly points to a new album of originals, but it's clear something other than the inevitable '74-'76 Bootleg Series release is on the horizon. I personally believe something will be announced and released before the next end of year Bootleg Series release. As far as I know there is no confirmation that Dylan and Don Was did record anything last year. Don Was said he did "something" with Dylan. That's why I still believe that a 2017 live album might be released in the spring of this year and that Don Was' "something" means that he mixed the record (he also mixed the successful "Unplugged" album). In that case the Dublin filming sessions would have taken place to generate visual material for promotion of the live album. Sorry, you are right. A live album/DVD could be a very likely possibility considering the evidence available. I'm not particularly excited for such a thing though as it generally points to the fact that he simply has nothing new to write and record. Unless, of course, it's for a comprehensive Never Ending Tour Bootleg Series release. But surely that'll be left for the day he drops, right? I hope it won't ! With BS 13 I got more than enough Dylan-gospel for years! And on another level: Regarding the US situation we see that all the gospel stuff in this country doesn't prevent from Trump or from school massacres! So I don't think he will make a religious album. Also, it's rare Bob goes back to a certain project after shelving it. For the release of BS13, maybe they finally thought it wouldn't be such a bad idea (the Toronto videos on Youtube were quite popular, so the people at Dylan Inc. decided to propose Trouble No More first, and then BOTT/Rolling Thunder (the latter being a future hit no matter what since it is the most well-known period of Bob after the 60's). However, an album of duets with Mavis is quite possible. Could be even political/introspective in the vein of her latest album "If All I Was Was Black". No one will expect it from old Bob but it could create quite a stir. Right now, all is pure speculation (no article in RS about new projects, no clear informations from the usual suspects on the fora). What I had picked up from that interview wasn't that Dylan lacked religious songs, but that once he got into the studio, he found himself restructuring some songs that became more secular in the process and writing new songs that fit better with the more secular revisions. Several of the songs on Tempest -- most notably "Narrow Way," but also "Duquesne Whistle," "Pay In Blood" and "Tempest" -- have spiritual qualities to them. And if he makes another gospel album, it wont' be in the vein of "Saved," which has more of a holy-roller type feel, but would be one of solemn devotion, like Johnny Cash's "My Mother's Hymn Book" or several of the other covers of religious material he put on the American Recordings albums -- "Unchained," "Redemption," etc. I think Tempest is as religious an album as he's ever done. I’m hearing that Bob is in studio recording in California, so maybe we will in fact get that new album this year. 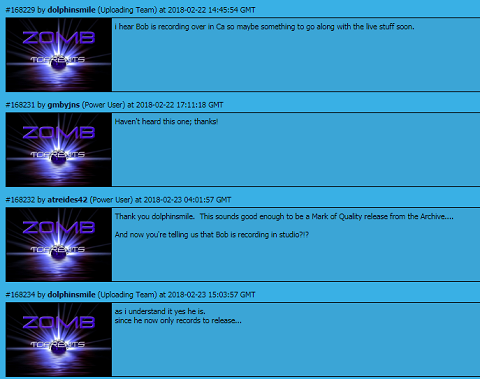 A well known Dylan taper posted this comment on one of his torrents today on the Zomb tracker. i hear Bob is recording over in Ca so maybe something to go along with the live stuff soon. So - though not the point of their statement - judging by their wording, the source is implying there is "live stuff" coming down the pike. I don't know if this was their intention but they mention this "live stuff" as if it's an already confirmed thing... This only carries weight with me because the source clearly is in contact with someone - either directly or indirectly - in the know. As for word of Bob recording in CA... Dude... NICE! Amazing to hear. This would line up with a lot of the other rumour. If all turns over this could be out in Spring. So - though not the point of their statement - judging by their wording, the source is implying there is "live stuff" coming down the pike. Reads like gigging to me, rather than a live album. I wonder if he's at Capitol studios again?? At any rate, it's great to hear any news of fresh recording. Could anyone quote exactly what the source says? I'm having trouble signing up using the link. Same here. Please double that request, thanks! I quoted it under the link above. That’s all there is. Thanks for clarifying that. Who is the taper? In that context "live stuff" certainly refers to the live recordings shared on Zombtracker. the article on Charlie linked in the other thread mentioned Charlie was real busy in Feb, so did dolphin mention the LA recording as when? --- anyhow thanks everyone for exciting rumorshopeit'snews! Go Bob Band! Yeah, that recent Charlie timetable has popped my expectation balloon somewhat.